Housepets! - View topic - What are your favorite panels? What are your favorite panels? Taking them in isolation from their individual strips, what are your favorite PANELS from Housepets? To be a little more clear, I'm considering some things I could take directly from Housepets and use in advertisements AND/OR make into stickers. So you don't have to settle on one! And feel free to concur with each other on favorite panels too. Re: What are your favorite panels? This is probably the panel that impressed me the most. http://www.housepetscomic.com/2011/08/2 ... ted-house/ - Panel 4. Pure emotional rage at it's finest. http://www.housepetscomic.com/2010/05/1 ... og-a-bone/ - Panel 4 also. just because Bino's eyes are awesome. http://www.housepetscomic.com/2013/01/1 ... -my-mouth/ - Panel 2. Tail snuggles. nuff said. http://www.housepetscomic.com/2013/04/0 ... situation/ - Panel 3. Peanut and Jack's look are to me a memorable drawing moment. http://www.housepetscomic.com/2010/12/25/christmas-cards/ - Panels 2, 7, and 8. Peanut and Grape's hug in panel 2 is just too cute and Grape's expressions in panels 7 and 8 are just... well look at her. 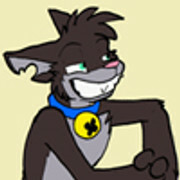 http://www.housepetscomic.com/2010/10/11/psychotic-psychic/- Panel 3. Sabrina's trollface... Nuff said. Last edited by Saturn381 on Mon Aug 05, 2013 8:08 pm, edited 3 times in total. Any screenshot that RandomGeekNamedBrent has used as his profile pic. I personally like the dogs playing poker (even though its already on a shirt). Why has no one suggested any of these? I personally like the dogs playing poker (even though its already on a shirt). I like copper's selections the best. can't forget the Grape wagon and the hundred slaps. Also Dancing Peanut as well, courtesy of Brent. I'm a big fan of the snuggle panels, as well as the one of Max getting spooked, the cool guys not looking at an explooshion, and King's reaction to seeing Duchess being seductive. My top five would have to be Super angry Bailey, Kung fu Fox, Tiger and friends, Shocked Eyeballs King, and mob boss Keane. Of course there's several other worthy panels such as Explooshion, dancing Peanut, sunglasses King and Spicy paws Falstaff. a)I would definitely agree with most of suggestions - mob boss Keene, shocked King, "Explooshion", dancing Peanut, etc. are just awesome! Not sure if this one-panel strip counts as generic "scared Max", or it's in a category of its own. And that one (panel 4). Probably. Okay, okay, NOW is the last one - I wonder if something can be made out of this one-panel strip. Last edited by valerio on Wed Oct 09, 2013 9:33 am, edited 1 time in total. I will forever be in love with the last panel of this strip. And the last panel of this one. Last panel here is also one of Sasha's most amazing moments. Fox's face is priceless in the last one here. Panel 2 is just YES. And what could be said about Panel 2 here. And I think that covers all mine. Oh, and this. All of them?=P. Can I say though, the snuggle panels are great, but if advertisement is one of the goals, some of the snuggy panels probably should be left for the readers to find out. Just saying, that's my opinion. That one. Totally that one. Why haven't I bought that original yet? Someone send me money! http://www.housepetscomic.com/2013/06/0 ... -epilogue/ -> First panel. http://www.housepetscomic.com/2012/12/2 ... christmas/ -> last panel. http://www.housepetscomic.com/2012/12/1 ... o-go-away/ -> last panel. http://www.housepetscomic.com/2012/10/2 ... th-trolls/ -> second panel. http://www.housepetscomic.com/2012/10/1 ... -glitters/ -> first panel. http://www.housepetscomic.com/2013/03/1 ... d-rinsing/ -> first panel. http://www.housepetscomic.com/2012/05/0 ... y-tonight/ -> the whole panel. http://www.housepetscomic.com/2011/10/2 ... -have-one/ -> the whole strip is pure awesome. http://www.housepetscomic.com/2011/10/1 ... -favorite/ -> we can't forget the guy who only speak in limericks. http://www.housepetscomic.com/2011/05/3 ... o-take-ii/ -> third and four panels are gold. http://www.housepetscomic.com/2011/04/2 ... d-reasons/ -> heaven is so awesome. http://www.housepetscomic.com/2011/05/1 ... -too-soon/ -> I love the art on this strip. http://www.housepetscomic.com/2010/08/2 ... nevermind/ -> fifth and sixth panel. http://www.housepetscomic.com/2010/04/1 ... the-world/ -> how romantic. http://www.housepetscomic.com/2010/01/2 ... of-action/ -> you have to admit they look awesome. http://www.housepetscomic.com/2010/06/2 ... -be-weird/ -> the whole strip is pure win. http://www.housepetscomic.com/2012/03/16/tight-spaces/ -> first panel is so hilarious. Why are they wearing costumes?!? http://www.housepetscomic.com/2008/11/0 ... e-animals/ -> third and fourth panel (though all of Peanut's faces were great). There's so many good panels... why nobody made a poll yet? You answered your own question. Polls can only have so many options. Yeah but you could make rotative polls to define which of them are the favorites between a bunch and the winners of each poll will be considered as the most popular. This is one of my favorites because it reminds me of a girl who harassed me a lot in school. I'm sorry. I'm very sorry. But my Bino Senses were too strong. Therefore, my favorite panel, the favorite of favorists is number 2 of this strip. But I still love the Lucretia one in the link. I think you could take her out of that panel and put her on some advertising, all of your art is very good but the way you drew her really stands out to me as an exceptional example of the Housepets! style. The one which I also have as my avatar. There are several kind of favorite panels of mine, they're mainly the cute and weird ones. Here they are, in chronological order. King In A Series Of Costumes At The Sears Photo Center - Amazing! Face It - Need to say? Ten Gallons Of Tailwhipping In A Five Gallon Can - Panel 7. Grape's shows her best with the broom! Stragedy - Panel 1. Really funny Daryl! That's Tragedy - Panels 5, 6, 7, 8. Best Karishad's cabaret show and best reference! Love Is A Phone Call Away - Panel 2. Will Sasha do that again? Wettest Fur Contest - Panel 2. The wet "kiss"
A Big Fat Yarn - Panel 1. Cubs cuteness! Decision Point - Panel 4. Go out of home, Tiger! Chain Of Memories - Panel 1. So lovely! Consultation Prize - Panels 4, 7, 8. Great Kitsune's expressions! You Have Chosen . . . - Panel 6. Great Kitsune's expression, once again! Dress For The Job You Want - No comment! Alone In The Dark - Scary and awesome! Last edited by Cesco on Mon Nov 10, 2014 4:56 pm, edited 9 times in total. http://www.housepetscomic.com/2013/11/0 ... be-served/ Panel four and five. The epic entry of the wolves (especially Poncho ^^) and the Outburst of the leopard! http://www.housepetscomic.com/2013/09/2 ... -guarding/ Panel three. Talk to the Hand! http://www.housepetscomic.com/2013/08/26/private-space/ panel three. I just wanna hug her! http://www.housepetscomic.com/2013/07/0 ... on-things/ the third panel (again?). Bigglesworth pose is awesome! I love it! ..................................................................... I clearly missed something because I don't remember that one at all. May I ask which arc, or specific strip, that was in? The third panel for the expressions.